Lode Runner (ロードランナー) is a puzzle/action game originally developed by Douglas E. Smith and published by Brøderbund Software in 1983. It made its way to many home computers and video games consoles of the day including the SG-1000. Like the NES port, this version only has 50 levels instead of 150 in the original Apple II version, but is much faster. 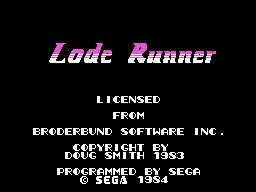 NEC Retro has more information related to Lode Runner.